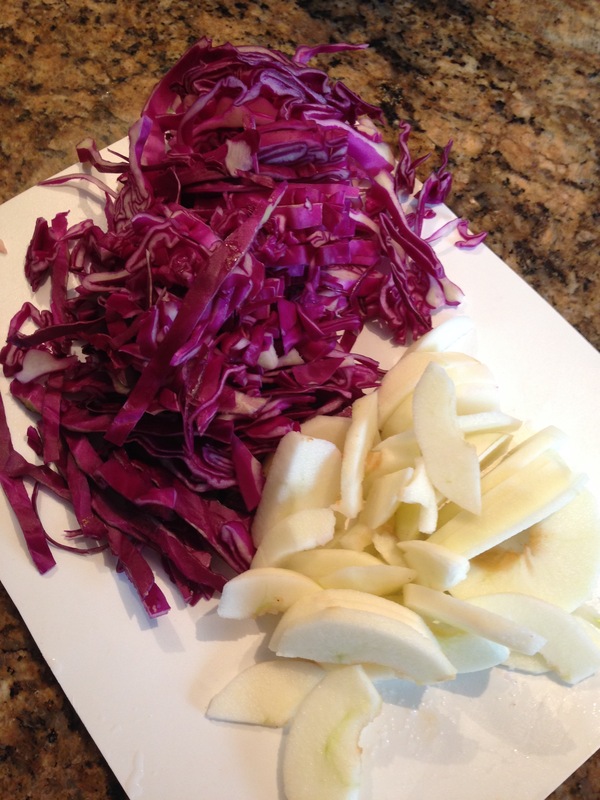 Braised Red Cabbage With Apples. 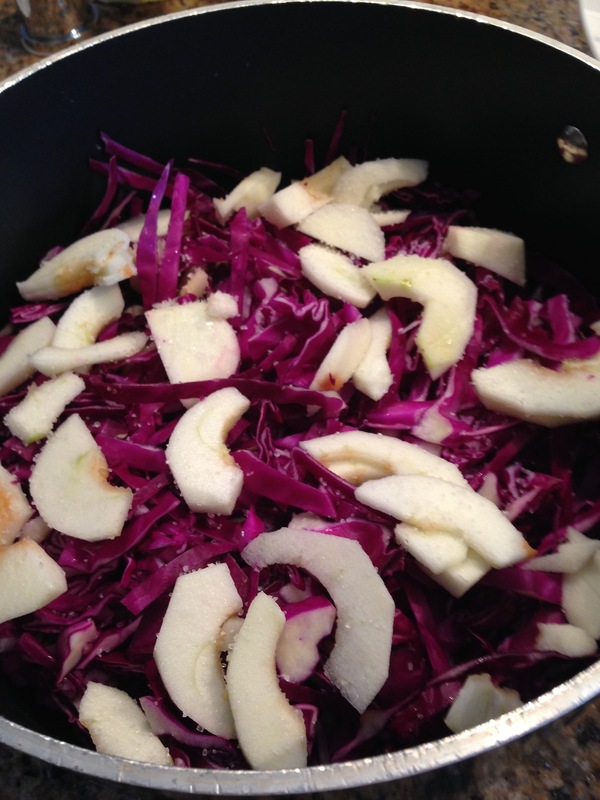 Winter wouldn’t be Winter without a big pot of Braised Red Cabbage with Apples! 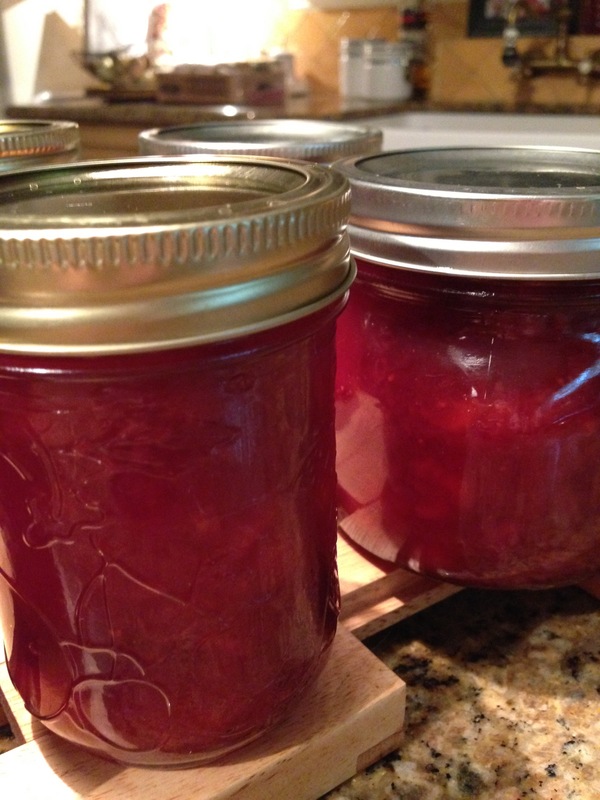 This is a family recipe that has been handed down by my mom and my grandmother. As you know by following this blog, we are big vegetable fans. Harry and I aren’t vegetarians but a diet rich in vegetables and fruits is just plain healthy. 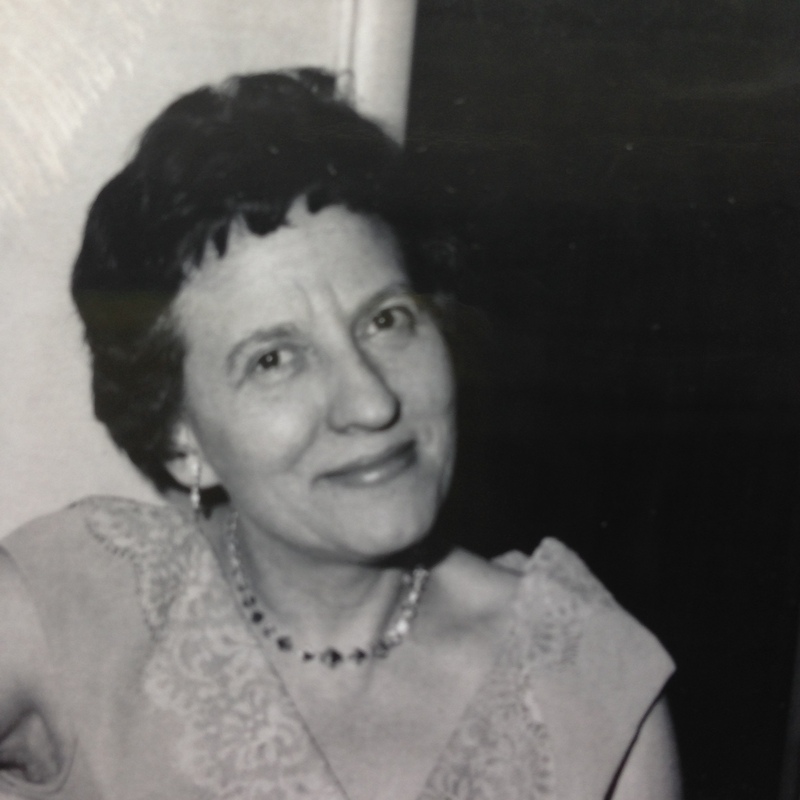 Red cabbage is regular visitor on the German table, so it’s my pleasure to share my mother’s recipe with you. 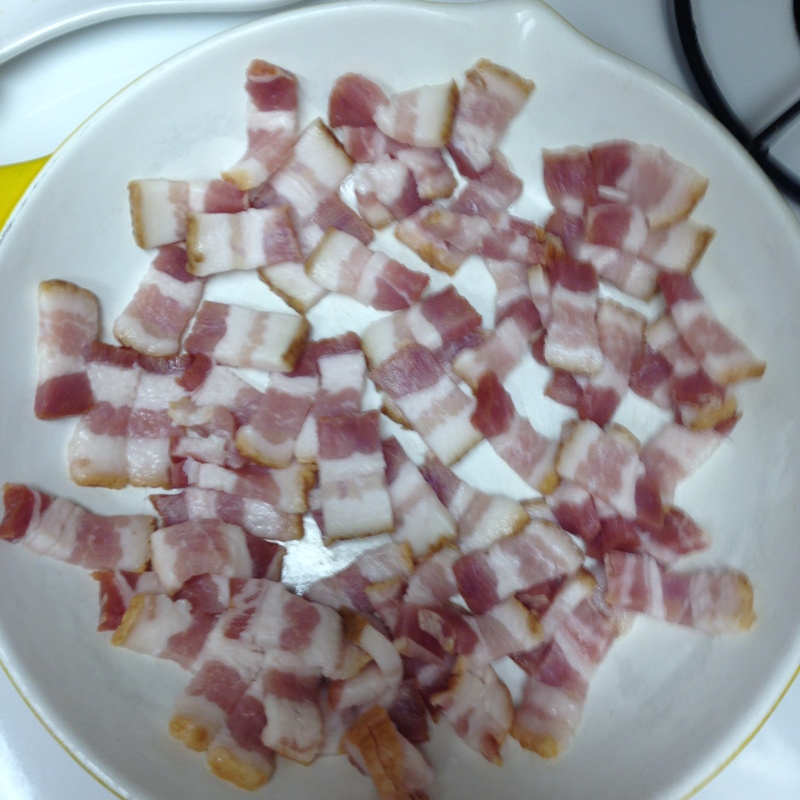 PS: Shhh…..Elfie’s Mom always put fried bacon in this recipe! 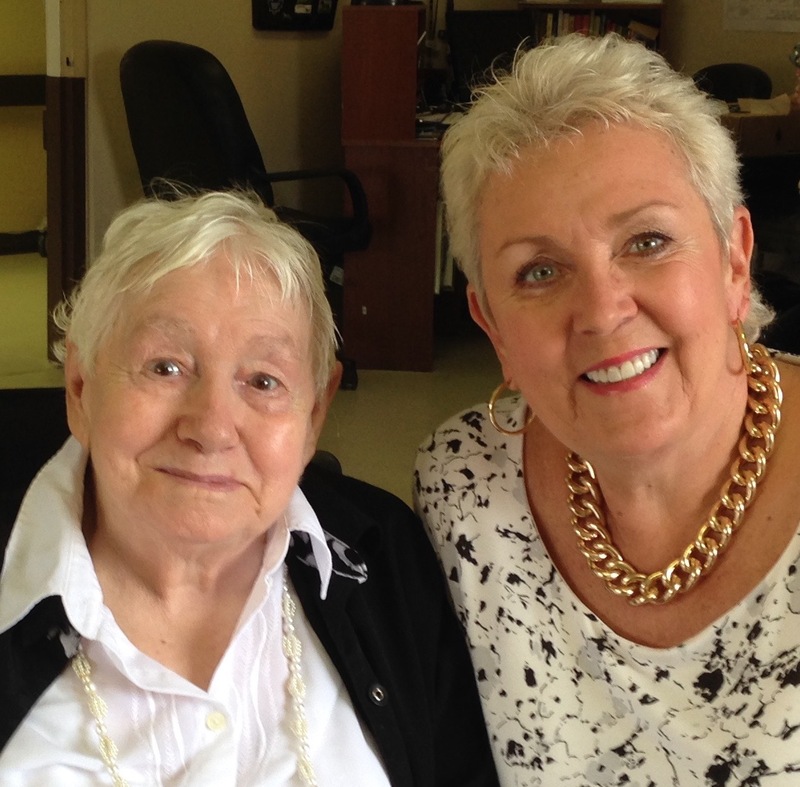 Maybe Bacon is the secret to living to 84! You’ll need a dutch oven to prepare this recipe. We don’t make it in a slow cooker, but you can certainly use one. The recipe makes a large batch that’s perfect for a big crowd or for freezing. Begin by quartering the cabbage. Remove the big white core. Now finely slice the quarters. 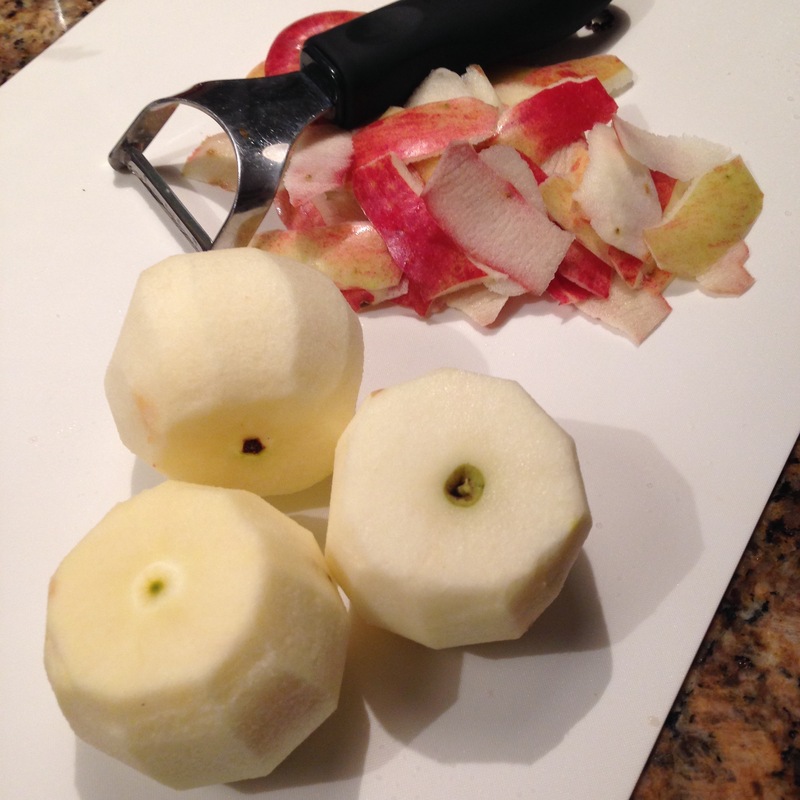 As you slice one of the cabbage quarters, layer on one sliced apple and a tiny bit of salt and pepper. (go easy here so its not too salty). 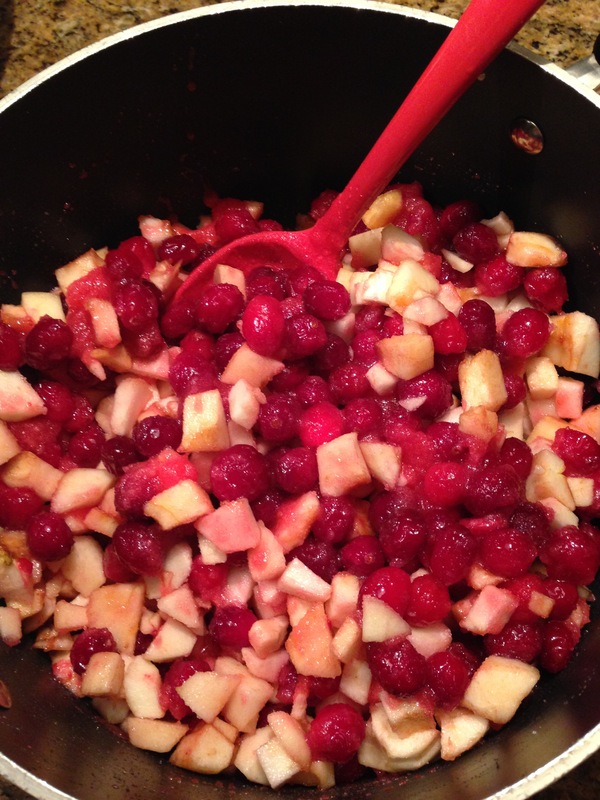 Once you have all the cabbage and apples layered, pour the other ingredients into the pot. Now, let the stove top or the slow cooker do all the work! Cook’s Tip: If using a slow cooker, cook on low all day and turn up to high with the lid off for about an hour to reduce the excess moisture. I cook the cabbage on medium-low for about 2 hours covered. Then remove the lid for the remainder of the cooking time. You want the excess moisture to cook away, leaving the cabbage in a light glaze. The dish is finished when the cabbage is tender and the apples have dissolved. Taste for salt and pepper. That’s it! Look at that color! 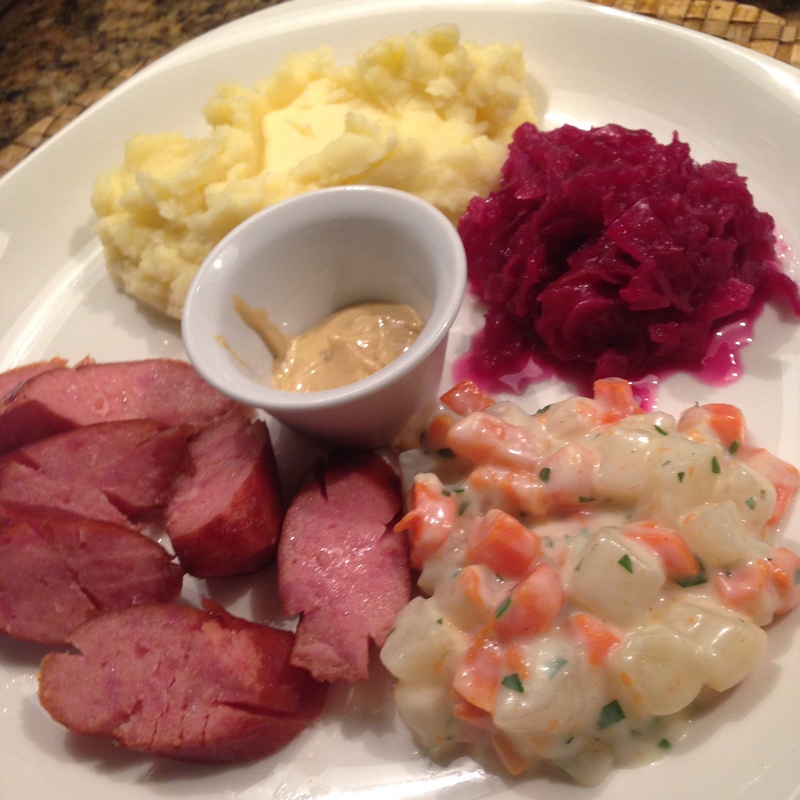 Here we served the Braised Red Cabbage and Apples along side quality smoked sausages with hot mustard and fluffy mashed potatoes and finally our creamed Kohlrabi and Carrots. It’s equally good with our German Rouladen. Next time you go shopping, look for this much under-used vegetable and you may just find a new side dish in our braised red cabbage! Creamed Kohlrabi and Carrots, Yum! Not many people know how to cook Kohlrabi. It’s not some strange tasting thing, but it does look a bit unusual. 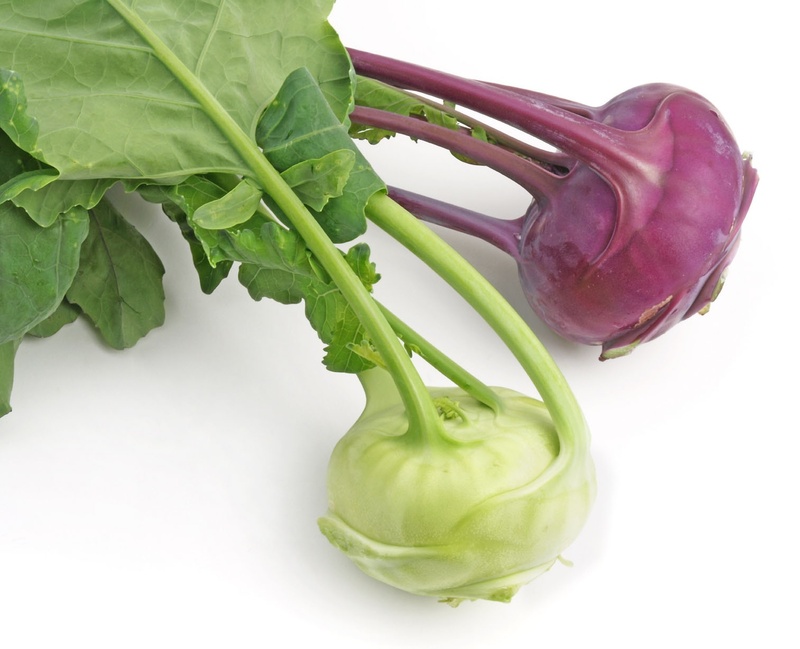 Kohlrabi is in the turnip family and has a very mild taste. It’s a very crisp veg when used raw but tender when cooked. Here we paired it with carrots in a cream sauce. 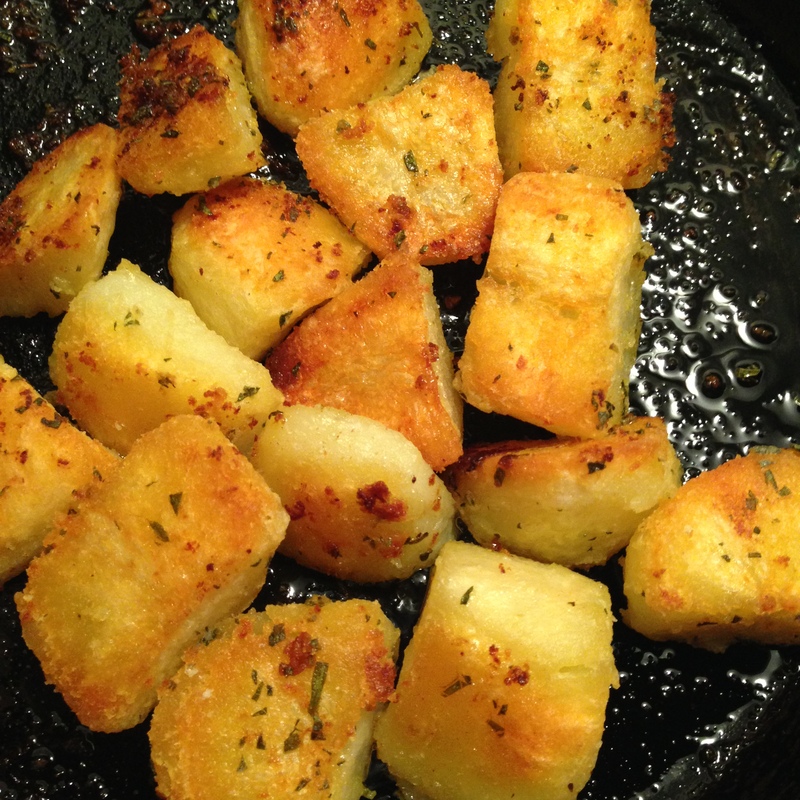 It actually makes a nice change from potatoes as the accompaniment to our Easy Roast Chicken. 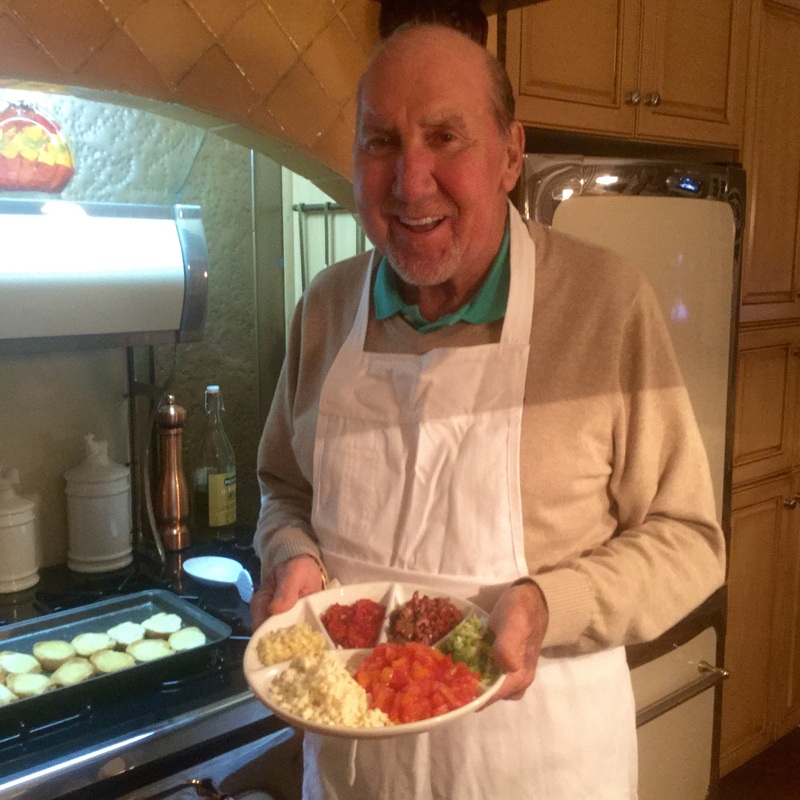 If you try this recipe and like it you can thank Elfie’s mom! This may be an old fashioned way of serving this much under-used vegetable but one that needs to be in your recipe box. Cook’s Tip: You must take a thick peel off to get to the crisp white flesh. We use a knife to peel them. Salt the dish once the vegetables are cooked and in the finished sauce. The stock cube can add enough salt. 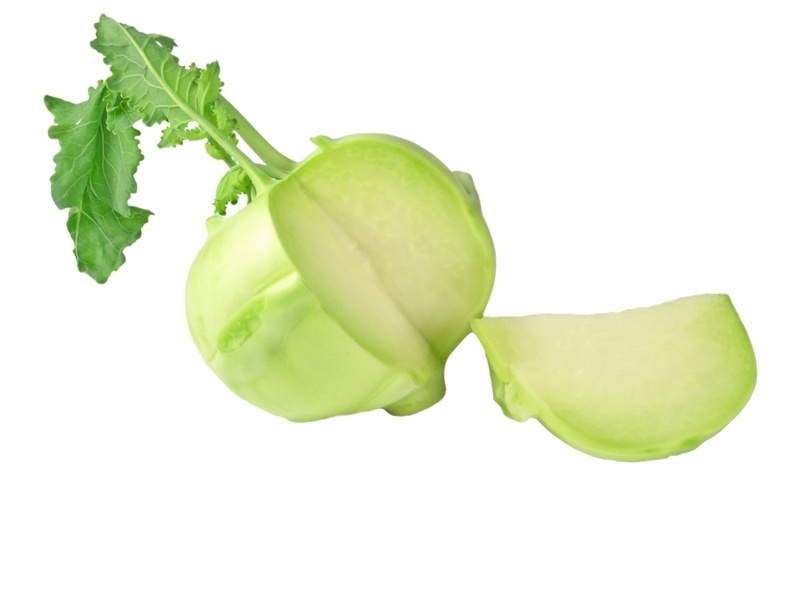 Once the vegetables are cut into 1/2 inch pieces, place in cold water with the stock cube and boil in gently boiling water unto the kohlrabi is tender. We can’t tell you exactly as they can be very crisp if fresh and somewhat softer if not so fresh. You want them to keep their shape but be just tender. While the veggies are cooking, make the sauce in a non-stick saucepan large enough to hold the sauce and the cooked veggies. Place the butter and flour into the saucepan and heat gently to melt the butter into the flour. 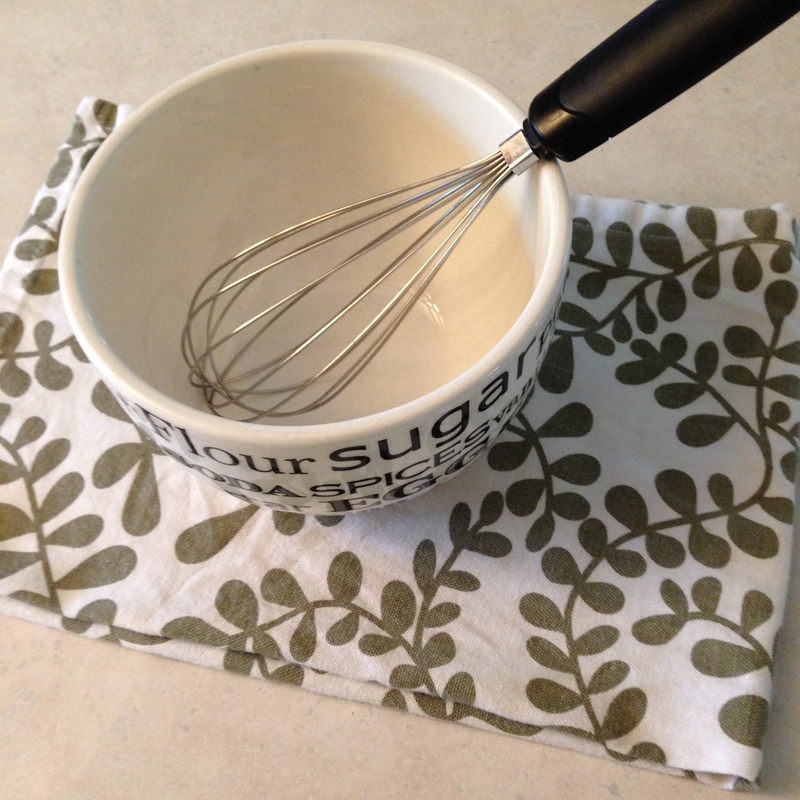 Once it is smooth, whisk in 1 & 1/2 cups of the milk. Turn up the heat to medium high and allow the sauce to thicken. If you find it’s really thick, add the remaining 1/2 cup of milk. Simmer for another minute. Now grate in the nutmeg and a good grind of pepper. 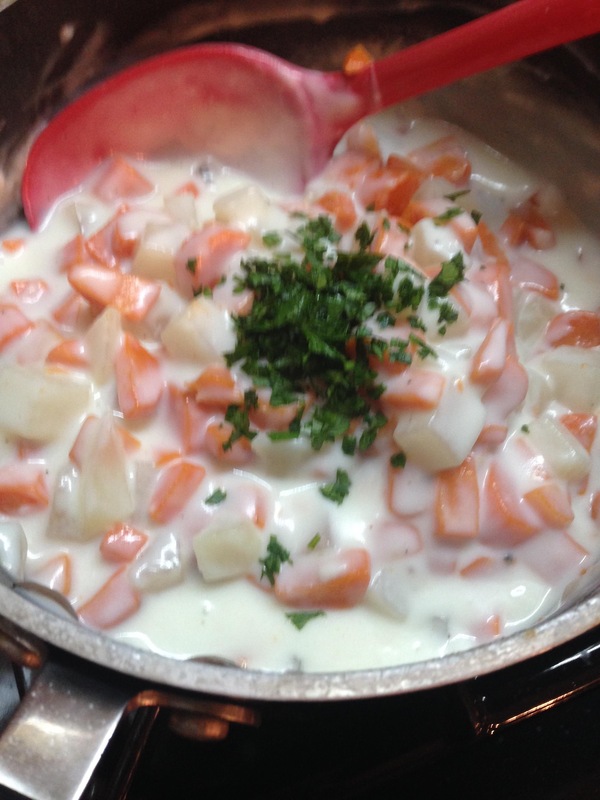 Drain the cooked Kohlrabi/Carrot mix and stir into the cream sauce. Add the chopped parsley and taste for seasoning. Add salt only if the finished dish is a bit bland. Top the veggies with another sprinkle of parsley when serving. 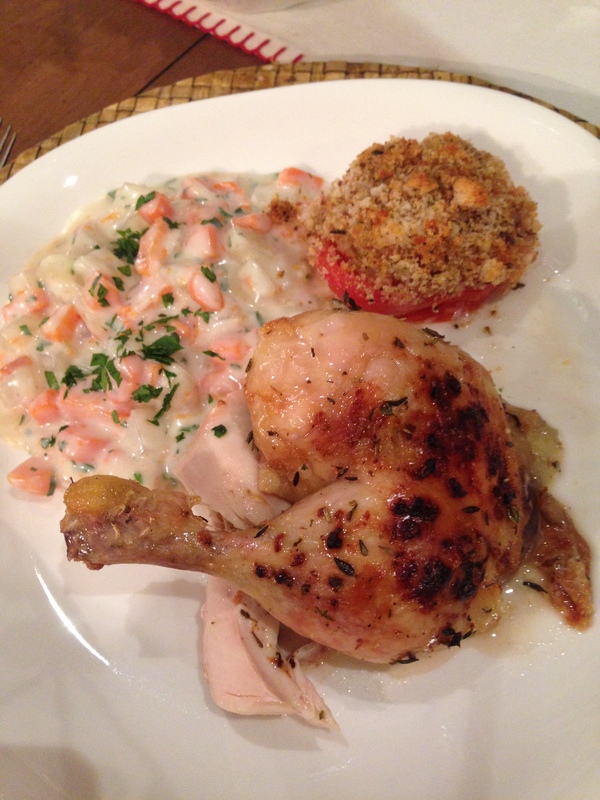 We served the Creamed Kohlrabi and Carrots with our delectable Easy Roast Chicken. No Potatoes tonight! You should give it a try. 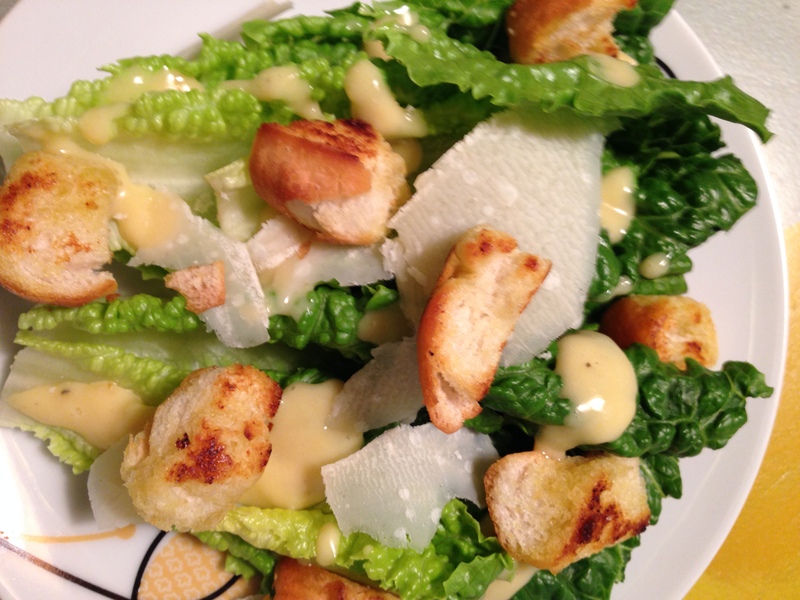 A Winter Salad Dedicated To Trudy. Our sister-in-law Trudy currently works and lives in Macau. We stay in touch each week by Skype and sometimes the topic turns to food, especially when we’ve just posted about something that isn’t easily available in Macau. Trudy has decided that when we can send a sample of our cooking via Skype we will have reached the height of technology. We agree! Macau is formerly a Portuguese colony on the southern coast of China so you know there would be a few “good eats” that Trudy could Skype back to us as well! This salad is a new rendition of an old favorite. 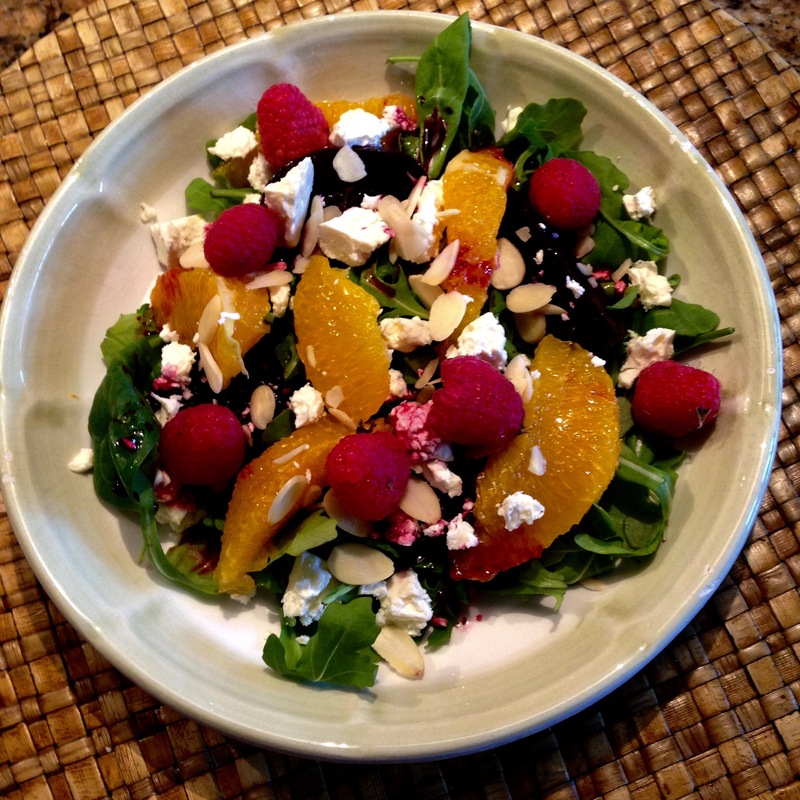 Here we’ve added oranges, raspberries and we substituted Feta instead of Goat cheese. We think beets taste best when slow roasted and the sharp salty taste of the Feta cheese adds to the vibrant flavors in this winter salad. When the weather turns cold we need robust salads that include sturdy greens, healthy toppings and high flavor dressings. This Roasted Beet and Orange Salad delivers on all counts. Lets get started. The best way to get the most out of the beets is to peel and roast them slowly with a splash of olive oil and some sea salt. Then marinate the beets overnight for the deepest taste. 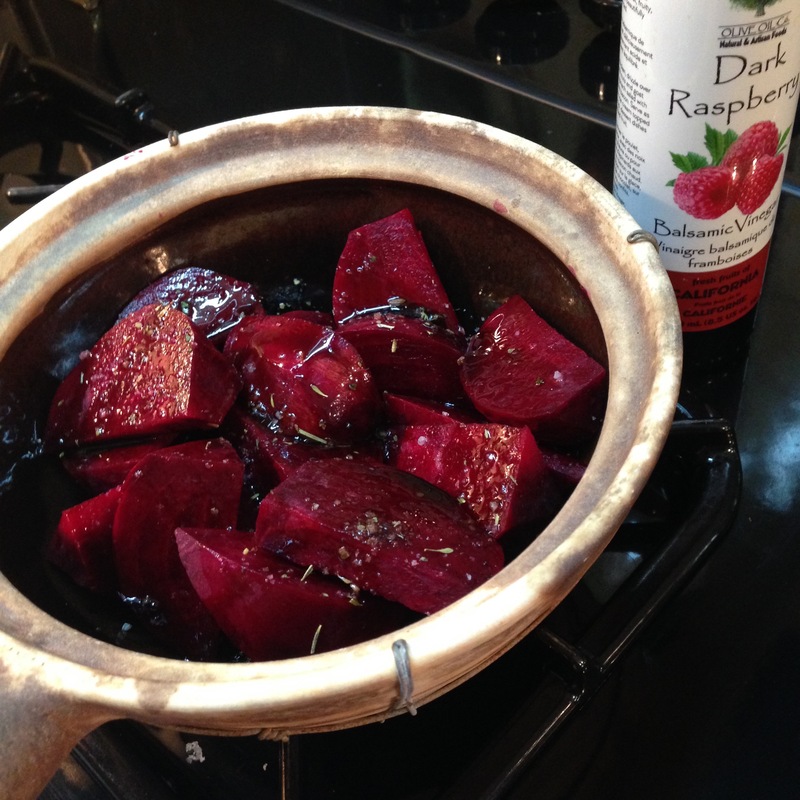 Wrap the beets in foil or place into a small roasting pot. 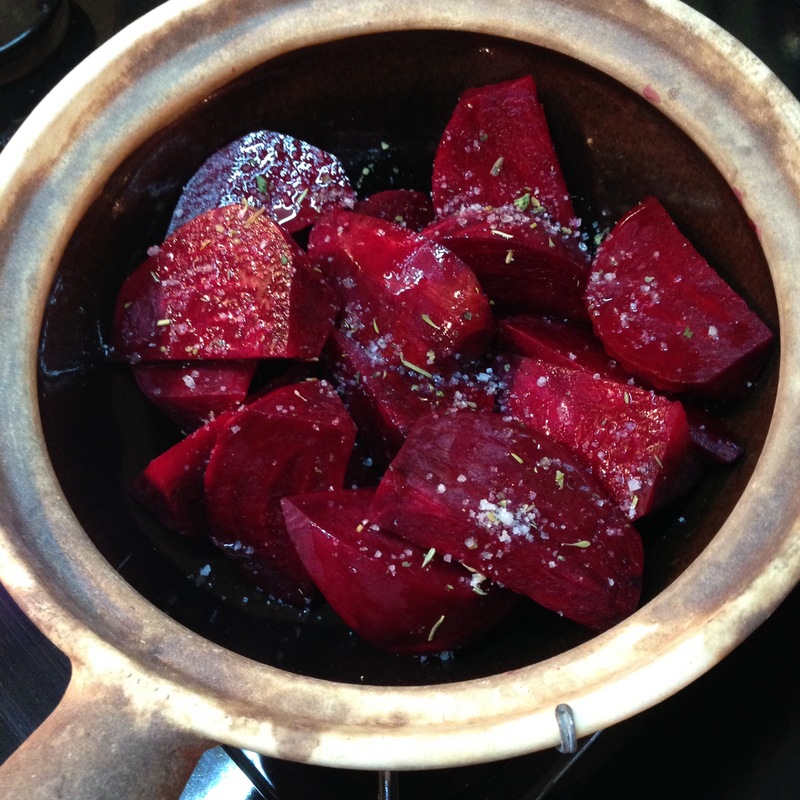 Bake in a low oven (300 F) for an hour or until the beets are tender. Greens of your choice. (We used a mix of Arugula and Baby Spinach) Watercress would be wonderful here. 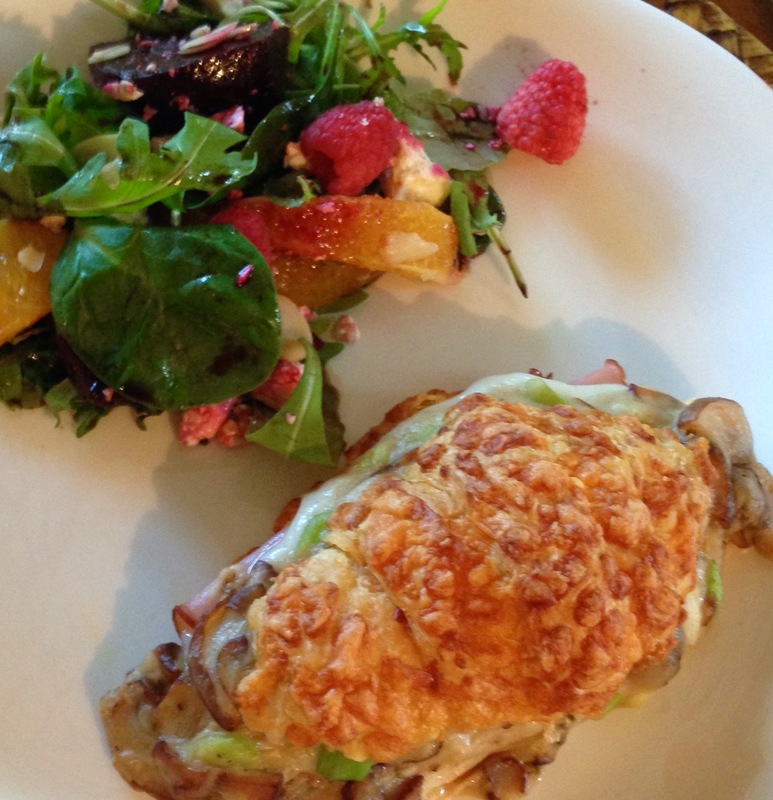 Today we served the Roasted Beet and Orange Salad with Heddy’s Ham and Cheese Croissant A roasted chicken breast and this salad would also make a great dinner! No more boring winter salads! Put This Dish In Your Repertoire! 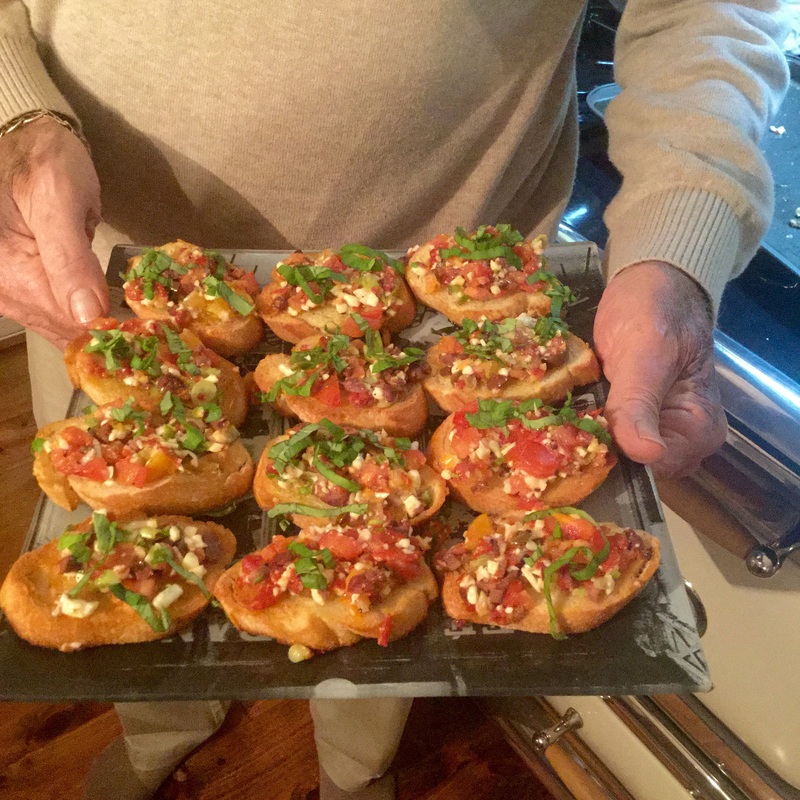 We love this Bruschetta recipe because its so versatile. 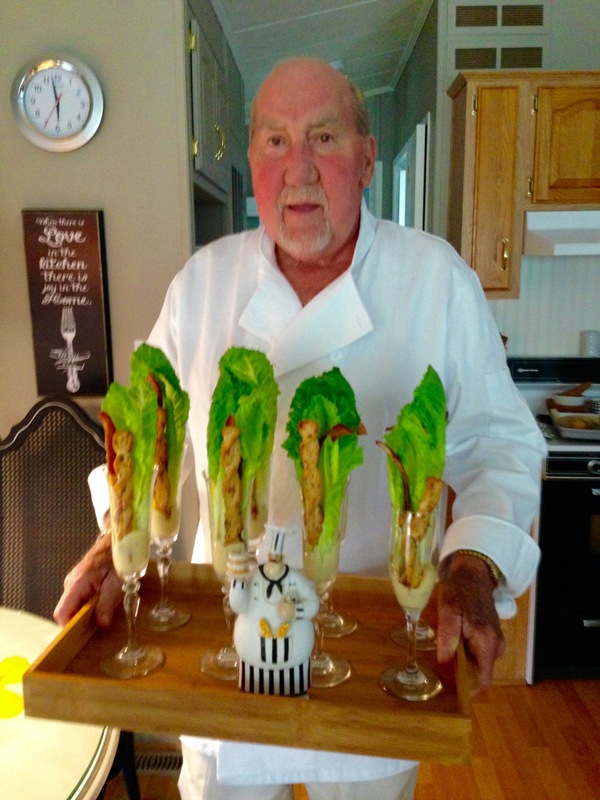 It can be a stand alone appetizer or a side dish to a great salad like Harry’s Famous Caesar Salad. Either way its a hit. If you’re having guests, you can prep the topping in advance and pop it in the oven when they arrive. Look how appetizing the finished dish looks! When we talk about versatility, we mean that the type of cheese, bread, onions, or olives and all be swapped up. If your baguette isn’t fresh enough to serve at dinner, don’t worry its fine for this recipe because you’re going to brush it with Olive oil and toast i t anyway. This makes 12 toasts. Serves 4 as an appetizer. 2 Tbsp olive oil plus an additional 2 Tbsp to brush the bread. 4-5 Fresh Basil leaves sliced to sprinkle on top of finished dish. Slice the bread and brush one side with the olive oil. Place on a baking sheet. Place all the ingredients except the basil in a bowl and mix well. Pop the bread under the broiler and toast lightly. Turn the bread over and toast the other side. Once the bread is toasted on both sides, top with the tomato mixture reduce the heat to 400F and return to the middle of the oven for 5-7 minutes. You just want to heat the topping not cook it. Serve right away but topping with the basil strips and get ready for the compliments! 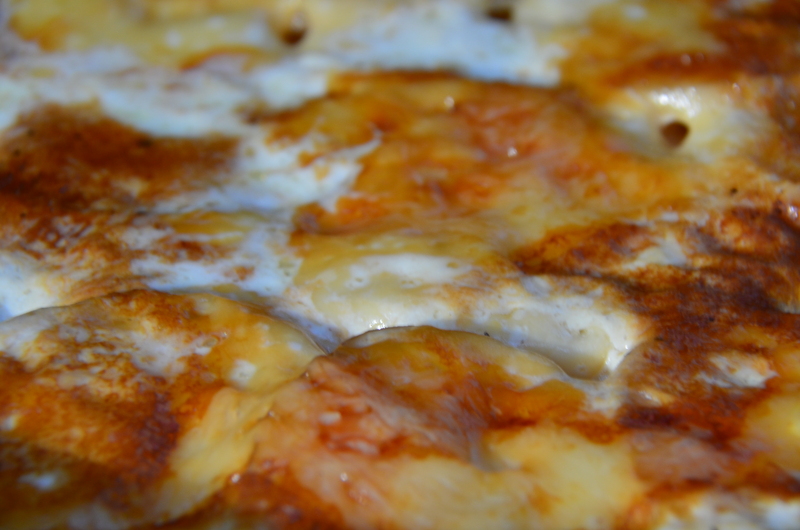 Scalloped Potatoes A La TwoFoodNuts. 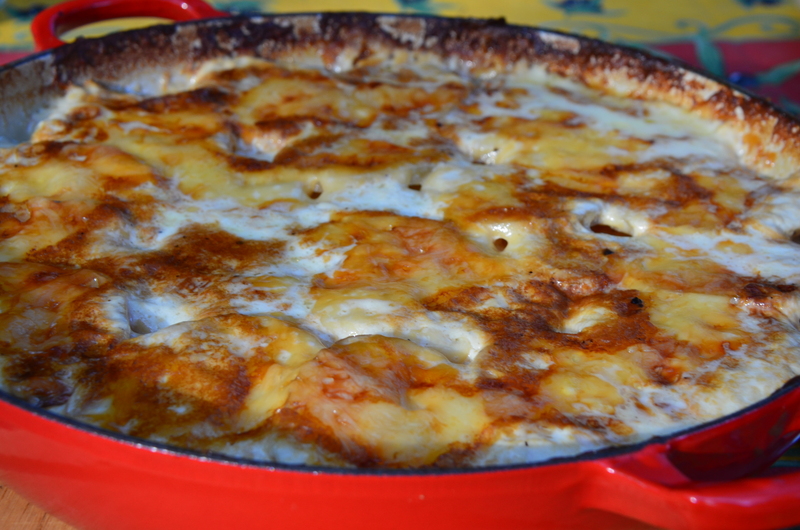 Scalloped Potatoes Reach Super Stardom. Most people don’t really think that Potatoes are particularly special or healthy. 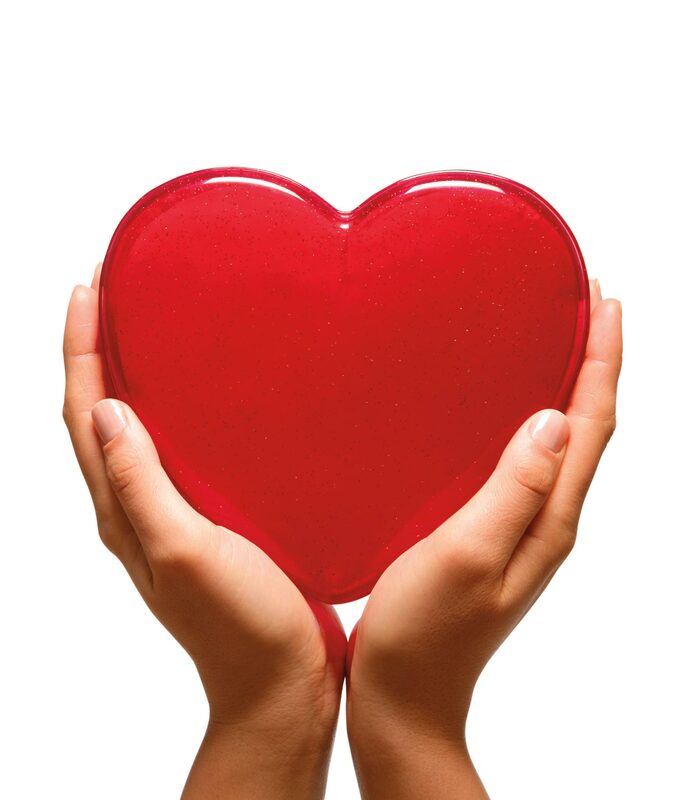 …and all this for just 110 calories and no fat, sodium or cholesterol. Our Scalloped Potato recipe takes this nutritional powerhouse and turns it into the star of your dinner. 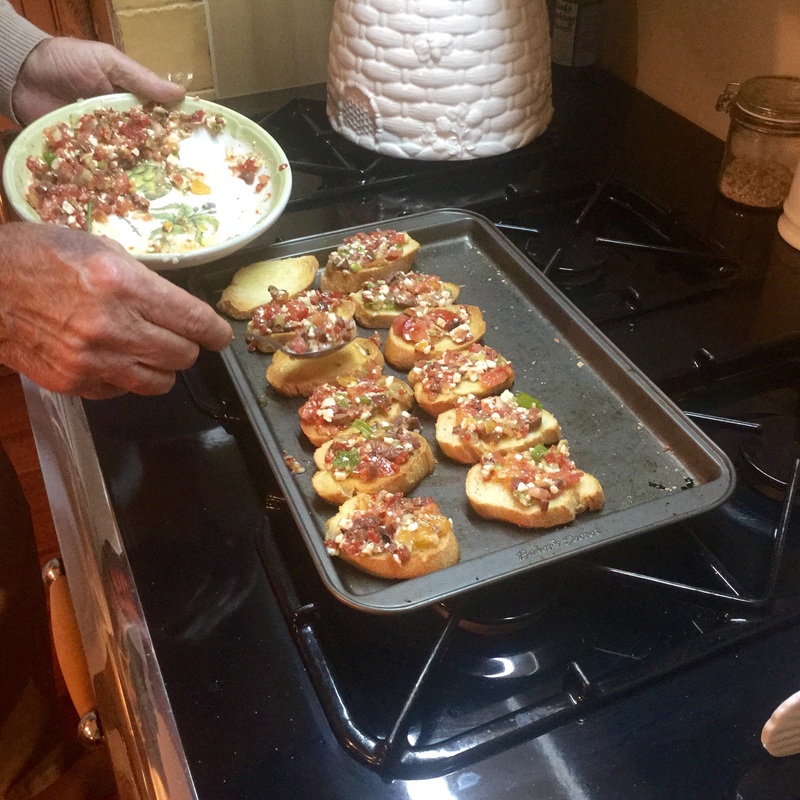 We love to make this dish when we have company because it can be assembled a few hours before the guests arrive and it bakes in the oven without supervision till the rest of the meal is ready. Please note, this is a high fat recipe. When we make it we pretend we’re French because the French love anything with cheese and cream. We only make this on special occasions, so go ahead and indulge every now and again. Use an open casserole dish that is about 6 by 9 inches or a deep round dish such as the one below that will allow at least 4-5 layers of potatoes. 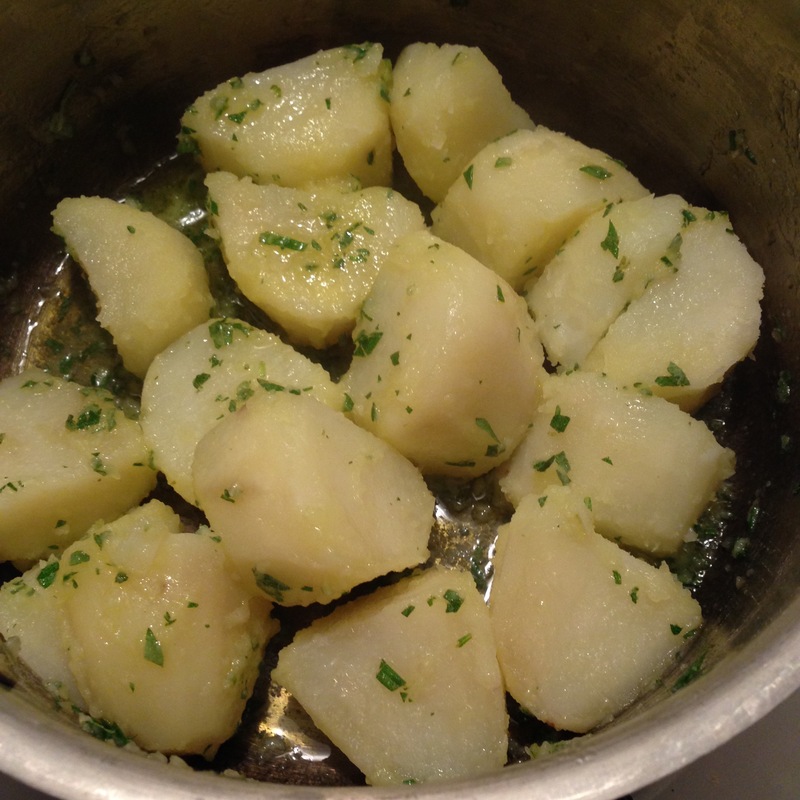 Using a Mandolin (see above), slice the potatoes to 1/8 inch thick (no need to peel if the skins are nice and thin). 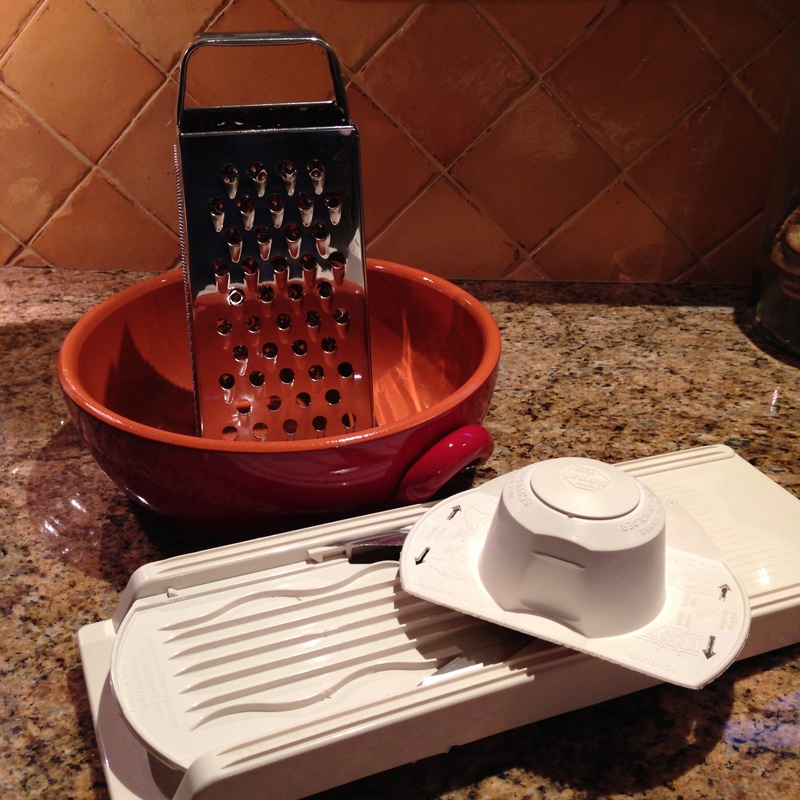 Grate the cheese on the course side of a box grater. 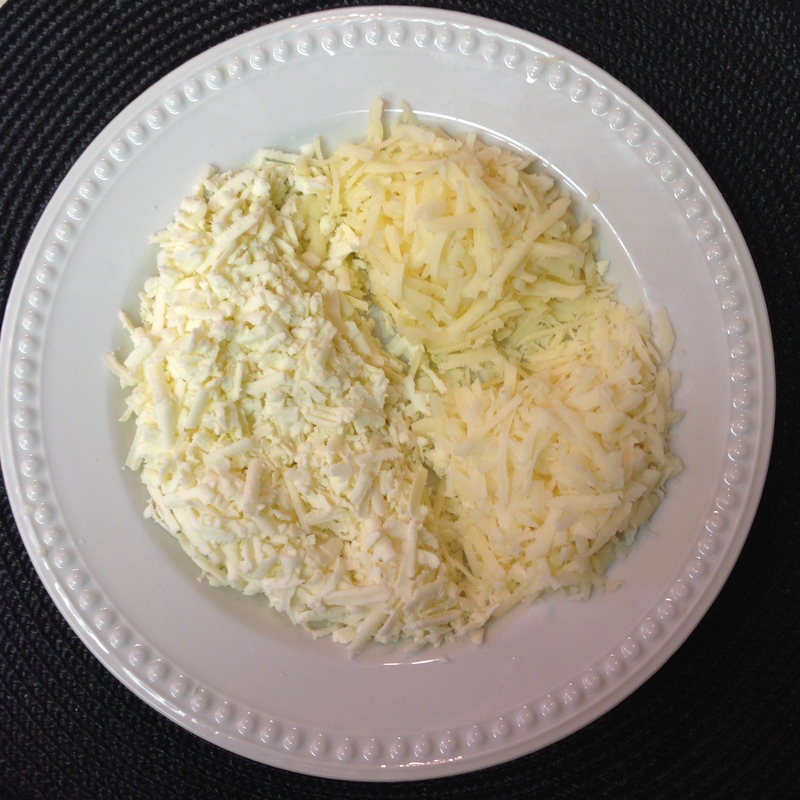 Divide the cheese in half. 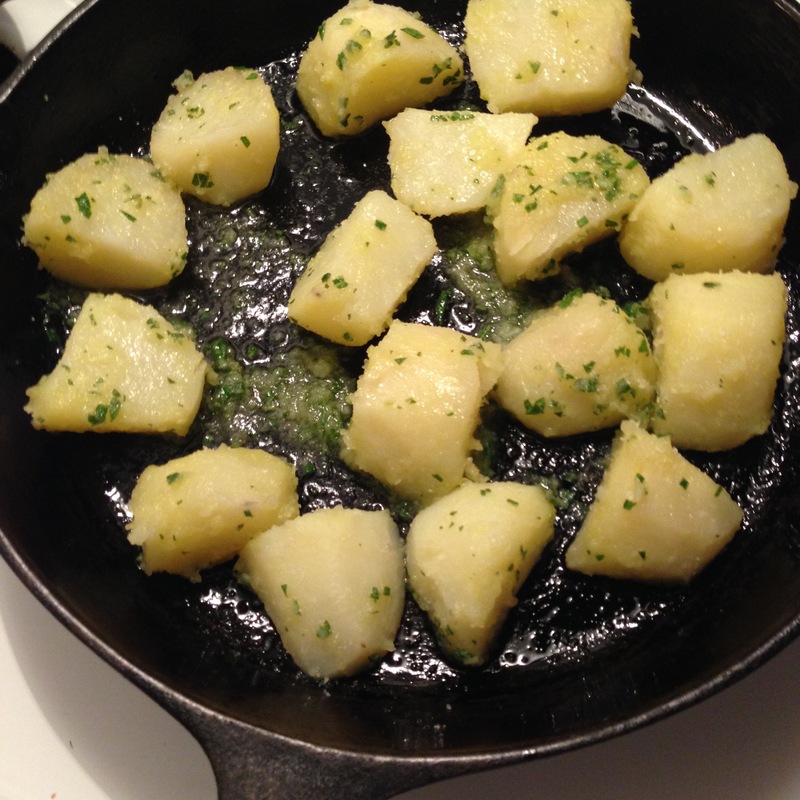 Begin by layering the potatoes in a single layer in your pan. Lightly salt and pepper the layer and sprinkle just a pinch of cheese over the potatoes, continue in this manner until you’ve used all the potatoes. Finish with the remaining 1/2 cup of the cheese. Pour the cream over the dish and it’s ready for the oven. We bake the dish at 300F so the potatoes soften and the cheese turns into a golden crust. The exact baking time will vary depending on the size of the casserole but it should take about an hour to bake completely. We test with a knife after about 45 minutes of baking. The tip of the knife should go right through the layers easily when its done. Don’t rush it if the potatoes aren’t nice and soft! Serve with your favorite meat or seafood. We love these potatoes with a succulent piece of Roast Chicken, or a thick juicy Pork Chop, but it works equally as well with a slice of Salmon or a Steak. At the Farmer’s Market we picked up a squash that was advertised as Potato Squash. 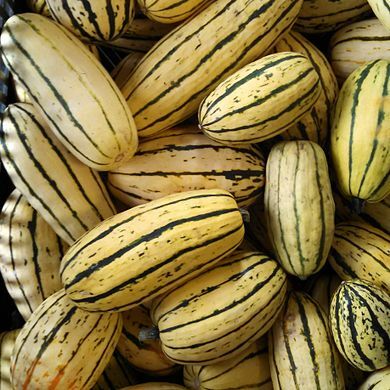 The funny thing is it’s actually named Delicata Squash, a much prettier name. 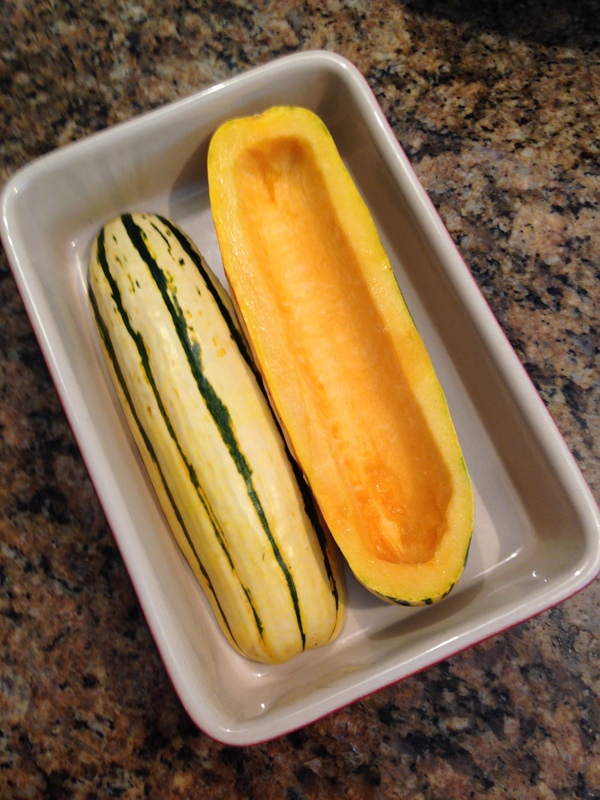 When we were ready to cook we needed to research whether it was a winter or summer squash and how to prepare it . Google to the rescue! In minutes it was being dressed for dinner! This humble squash could be the star of your Thanksgiving dinner. The pumpkin seeds and cranberries are sure to compliment the Turkey! 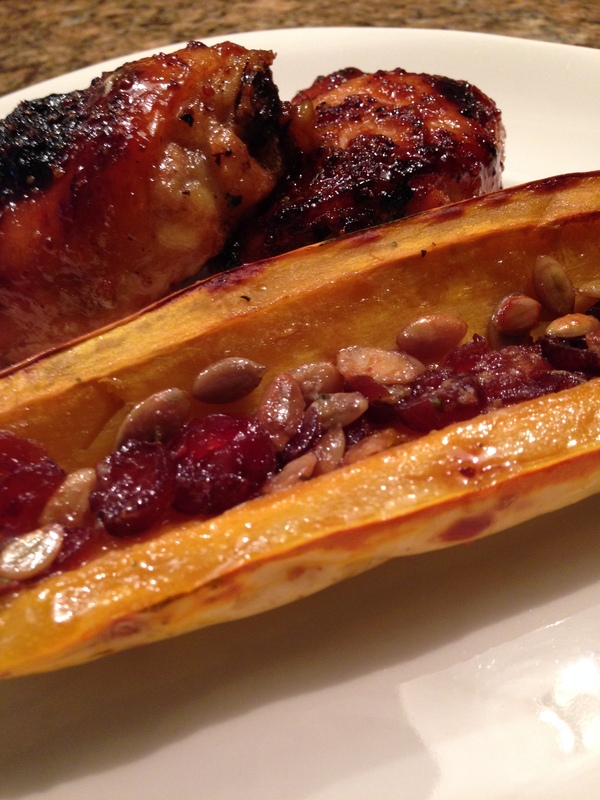 Since most squash benefits from roasting with some sort of fat we opted to prepare it to match the flavors of the Honey Mustard Chicken thighs we had on hand for dinner. We’re happy to report that we think this is a hit! The flavor was not unlike a potato, so now we understand the nickname. We’re certainly going to serve this to company! If you haven’t given this humble little squash a try, perhaps this recipe will change your mind. We think even the kids will like the taste due to the gentle flavor and the addition of honey to the recipe. ½ Squash per person is a serving. Mix the appropriate amount of honey and cider vinegar in a bowl depending on the number of squash you are cooking. Salt and pepper the squash, dollop the butter along the squash and spoon a bit of the honey and vinegar mixture on top of each piece. Finish with the pumpkin seeds and cranberries. 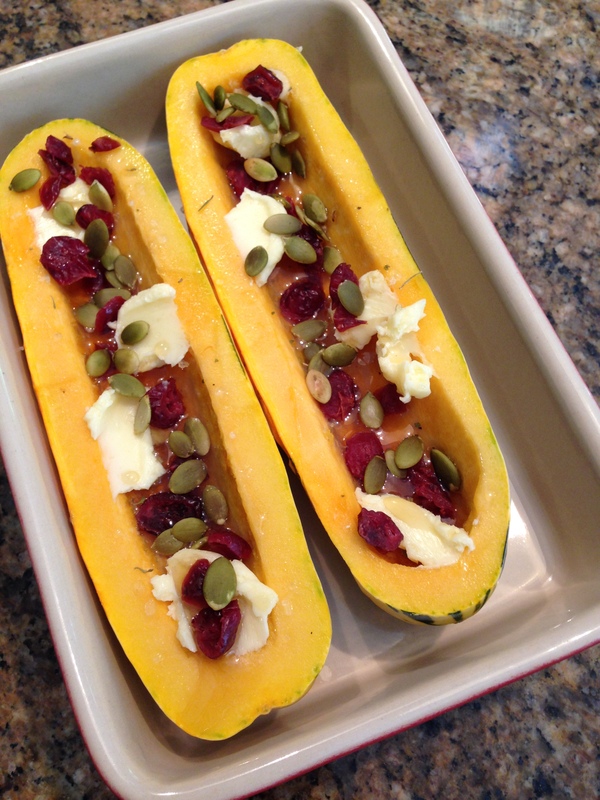 Bake in a hot oven, 400F for 20-30 minutes depending on the size of the squash. It should be well browned and the tip of a knife should pierce the flesh. Cooking times will vary. We served it with Nigel Slater’s Sticky Chicken Thighs recipe. Give it a try! Don’t be afraid to try new things. 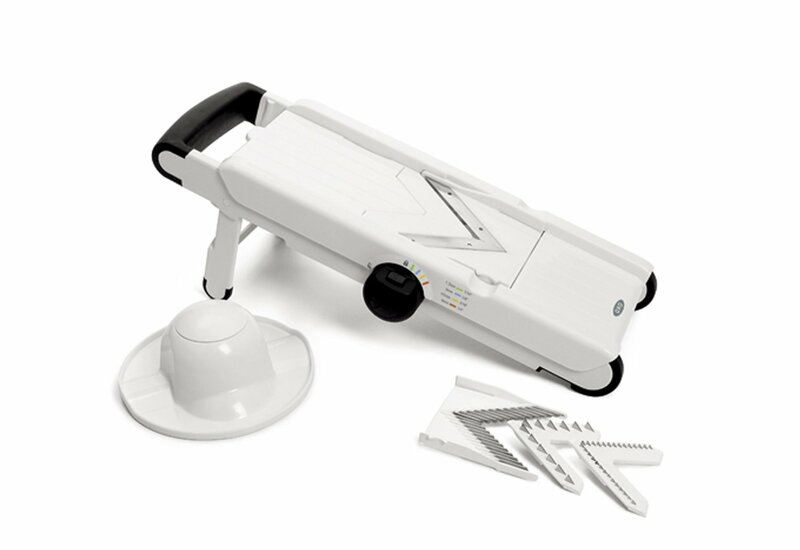 You will increase your cooking skills and thrill your family all at the same time. Your guests will be delighted to try something new as well! Happy Fall! If you have company coming and you need a light and savory dish, you’ll have to give this a try. You can make it in advance so there’s no stress at party time. You can also make this as a light lunch. We enjoyed it on our recent picnic with a side salad of Arugula and grapes. Serves two for lunch or 4-6 as an appetizer. Heat oven to 450F. Spread out the sheet of Puff Pastry. Using a fork, prick the pastry all over but not within 1/2 inch of the edge. 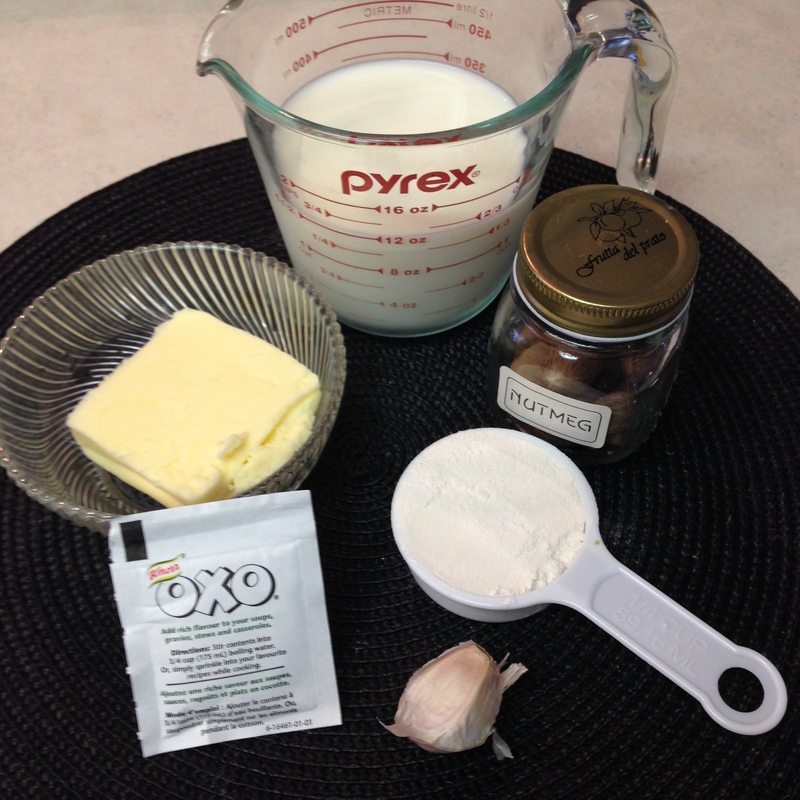 In a small bowl, mix the goat cheese, grated garlic, and Herbs de Provence. Crumble the goat cheese over the tart. 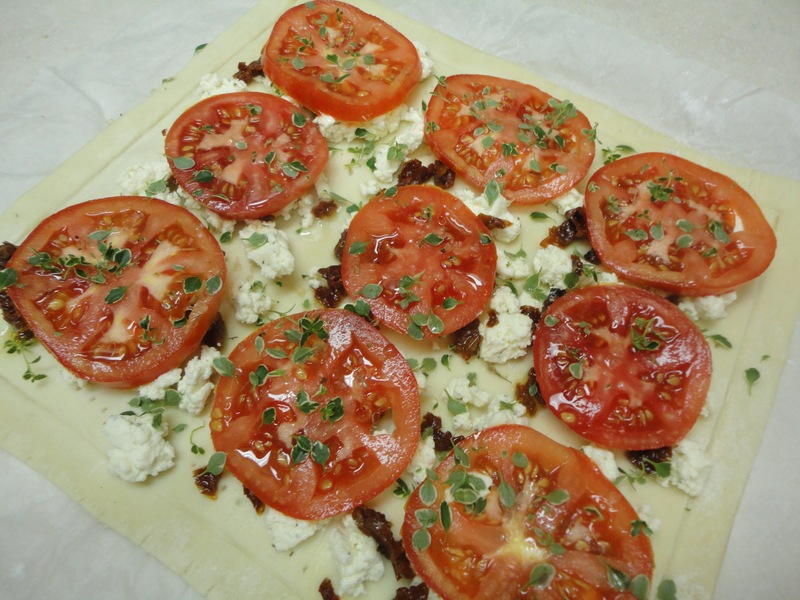 Distribute the sun-dried tomatoes over the cheese. Lay the tomato slices on top. 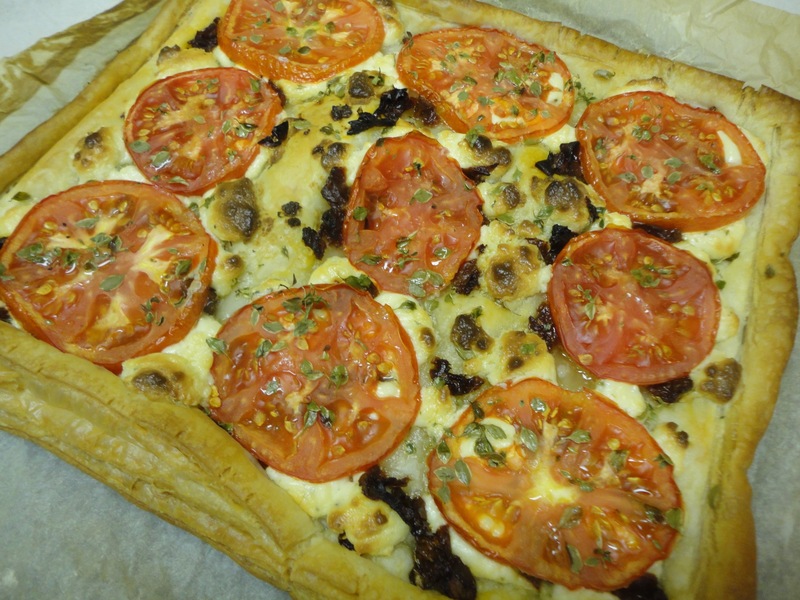 Pluck the leaves from the thyme and sprinkle over the tart. Salt and pepper the tart. Using a spoon, lightly drizzle the olive oil over everything and bake on the middle shelf of the oven. It’s ready in under 20 minutes. If making for a party, assemble the tart early in the day and cover with cling film to refrigerate until you are ready to bake it. 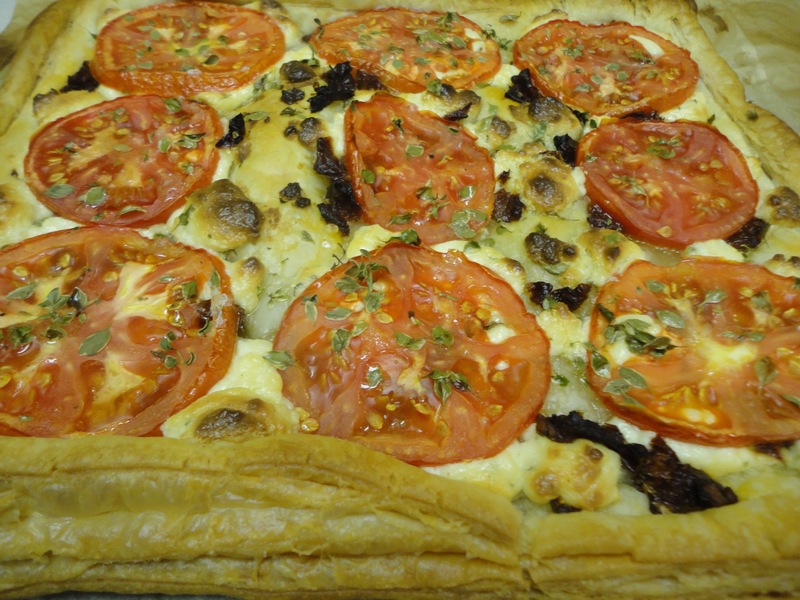 The result is a light tart with rich goat cheese underlying the juicy tomatoes and herbs. Whether served as an appetizer or a light lunch this is a tomato and cheese lovers treat! Bacon and Cheese Cauliflower Bake. 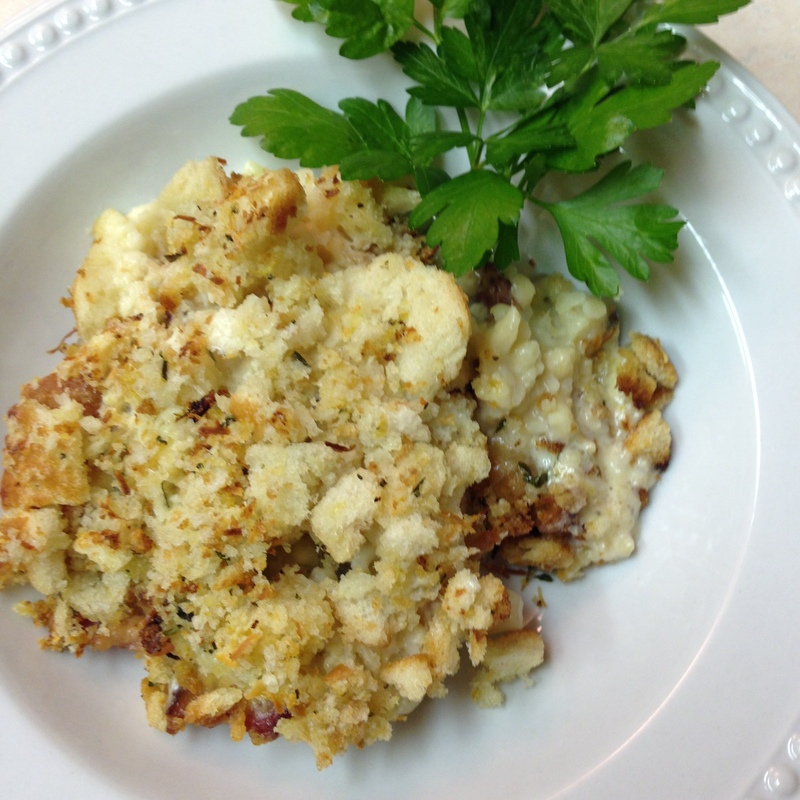 Bacon and Cheese Cauliflower Bake, What’s not to Love? We just happen to love cauliflower. We also think there’s not much that can’t be improved upon by using Bacon and Cheese! So we came up with this side dish that works with just about any meat but to be honest, Elfie eats it as a meal with a salad. Ok, she doesn’t always eat the salad! 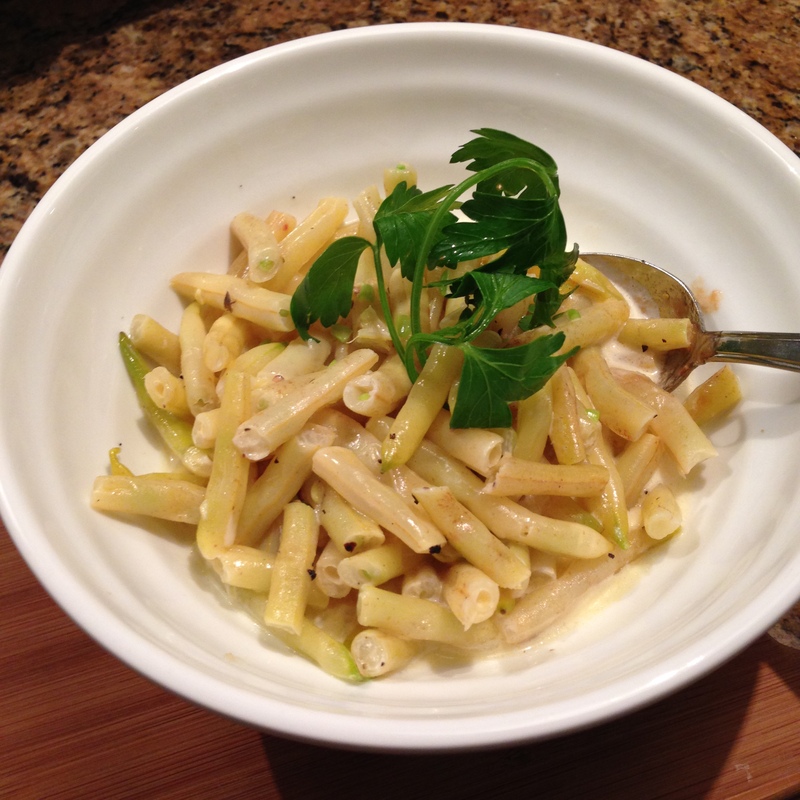 There are a few steps to this dish but it is easy enough for a novice cook to create! We use our “Crummy Topping” in this dish so just click the link to get to it. It’s a good idea to make the topping as a separate recipe first. Set it aside while you do the rest. Cook’s Tip: Use sharp cheeses to give interest to the sauce. We use Feta, Parmesan and aged White Cheddar. You can use whatever you like or have on hand. No rules here! Cut the Cauliflower into florets and steam until just tender. 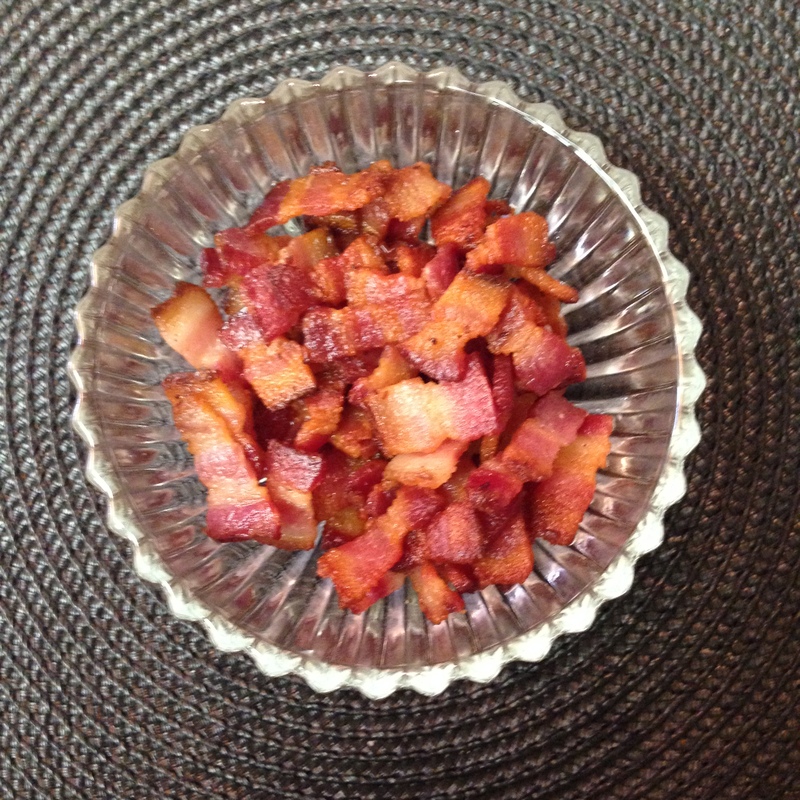 Fry the Lardon until crisp, drain off fat. 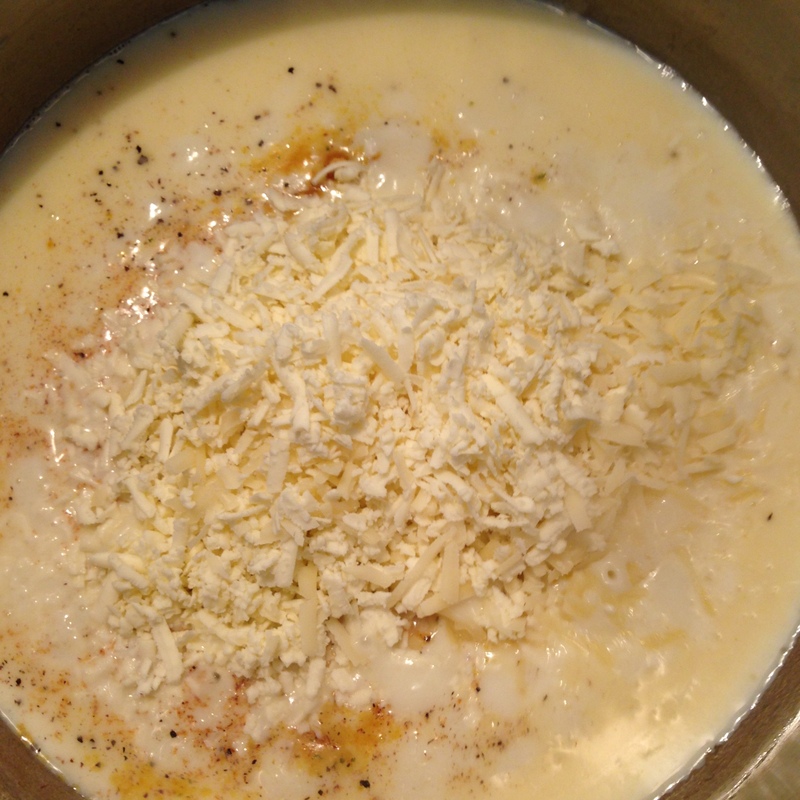 In a large saucepan melt the butter together with the flour. Stir it into a paste and add the milk all at once. 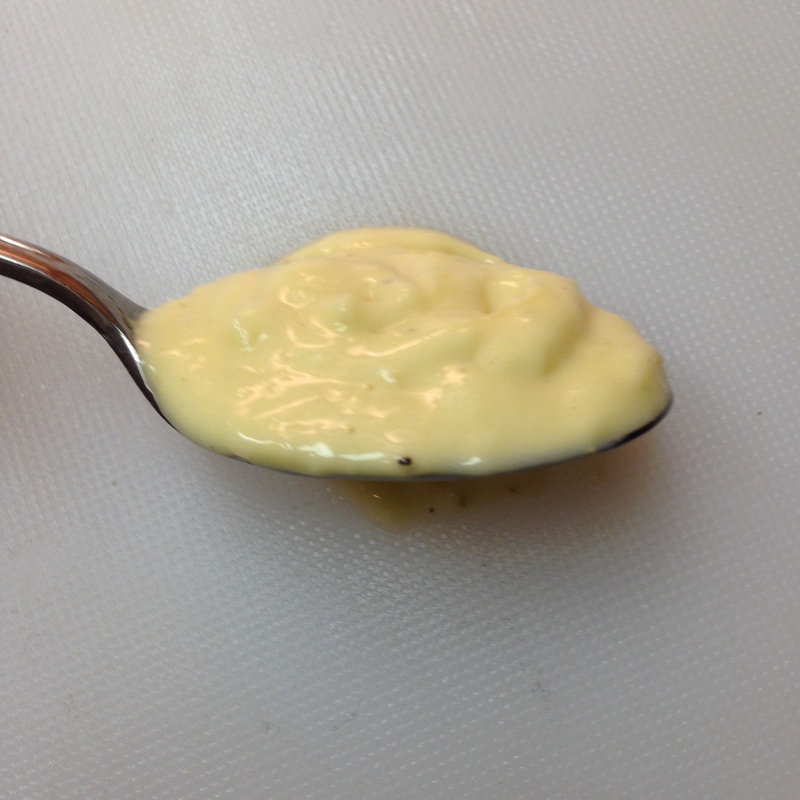 Whisk the sauce until its nice and thick over medium high heat. Add the stock cube or packet, nutmeg, garlic, bacon, salt, pepper and all the cheese. 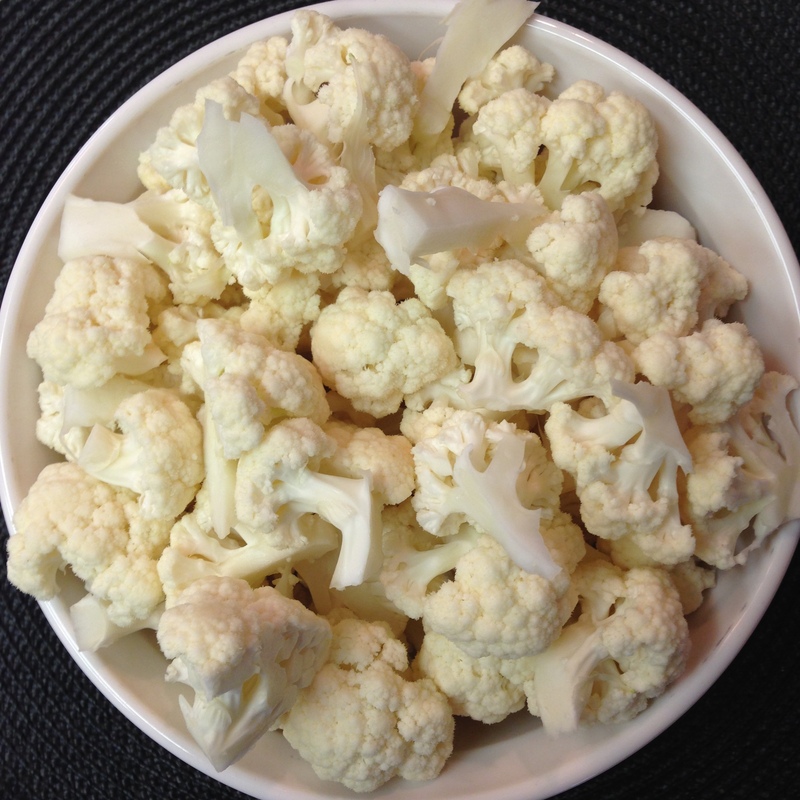 Place the cauliflower into the sauce and stir it well to incorporate. Spread the mixture into a buttered casserole dish large enough to hold everything. Spread the Crummy Topping over the casserole and bake at 350F degrees until you can see the cheese sauce bubbling and the Crummy Topping is golden brown. We hope you’ll give this recipe a try for your next family gathering. We believe it will be as big a hit at your table as it has been at ours! Beans, Beans The Magical Fruit! Two Food Nuts Baked Beans. We’re at the cottage a good deal of the summer and there are days when it’s really just too hot to cook. That doesn’t mean you can’t make something that requires cooking though. You just have to use your Bean! Or in this case your slow-cooker. 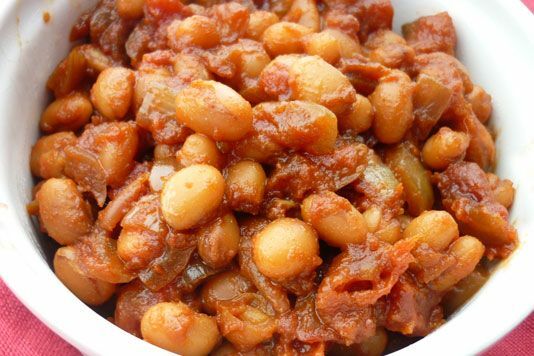 Baked beans traditionally require soaking beans overnight then boiling them for an hour, but let’s get real! 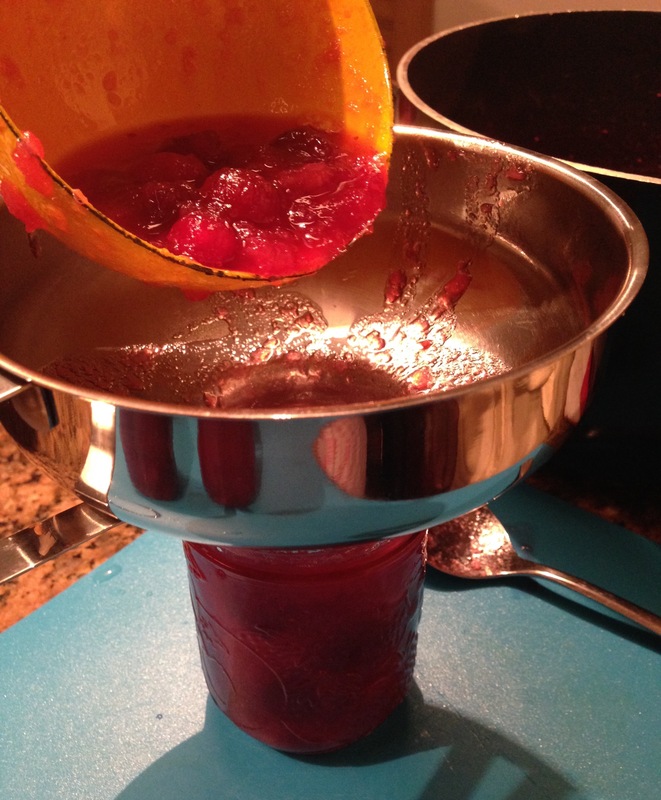 We want good food without steaming up the kitchen or our glasses and we found a way to do it! The pantry is often your best friend, so throw open the door and let’s get out the cans of Navy Beans, those little plump white, pre-soaked, par boiled darlings. We’ll add some great flavoring to the beans and put the slow-cooker on the picnic table till dinner’s ready. No sweating and really very little preparation. Here’s how these Two Food Nuts make “Baked Beans”. 3 – 19 oz cans of navy beans. Drained, rinsed and placed in a slow cooker. 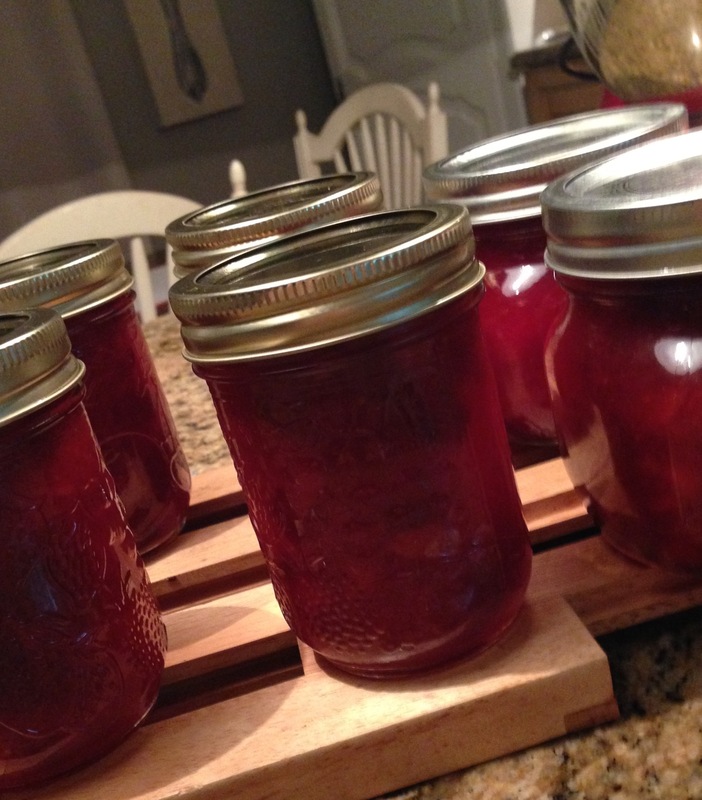 1/4 cup Molasses or if you live in Quebec like our son, it must be Maple Syrup! 2 tbsp cider vinegar, those of us that are adventurous might even give Balsamic a try. Optional: And now for the secret ingredients. 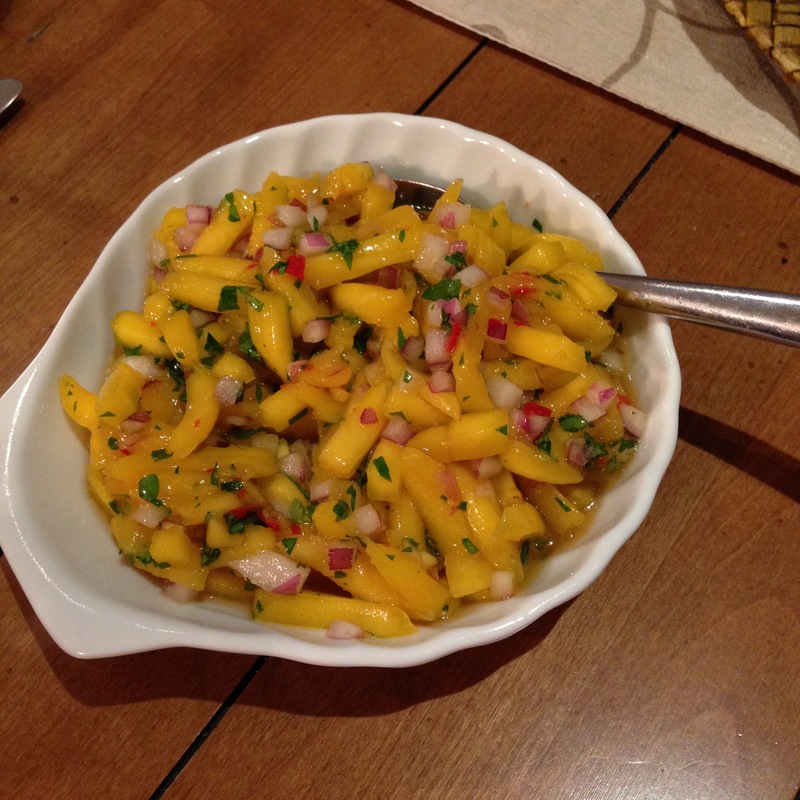 A small mango or peach peeled and diced or even an apple adds a sweetness to each bite that makes it taste wonderful. Some “Like it Hot” so add your favorite hot sauce or fresh chili for a thrill! Once you have everything in the slow-cooker, stir gently to incorporate all the goodness and set on low until dinner. We suggest at least 6 hours. Check the beans after 4 hours and if they are tender and the flavor has developed you can switch to the keep warm setting. Slow-cookers vary in temperature so always check at the 4 hour mark. Remember you are starting with beans that are fully cooked, so you can prep these at lunch and still have full flavored baked beans by supper. These baked beans will last in the refrigerator for several days if tightly covered. That is if you have any leftover. If you are feeding more than 4 people you may want to double the recipe. These disappear fast! Add a side of beans to your bacon and eggs this weekend! 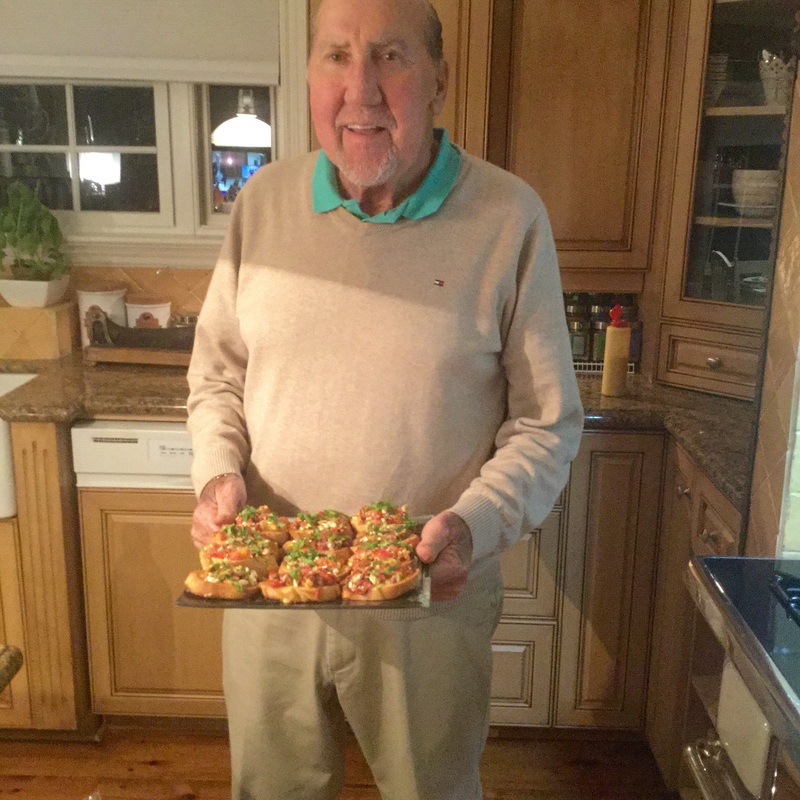 Don’t forget to share the recipe with your Facebook and Twitter friends. We love to know how you like the recipes, so please leave a comment below. When we think of vegetables, we don’t automatically think about how much we love carrots. They have been categorized as something ordinary, something you just have in the fridge and have to use up. But in fact they are something special. 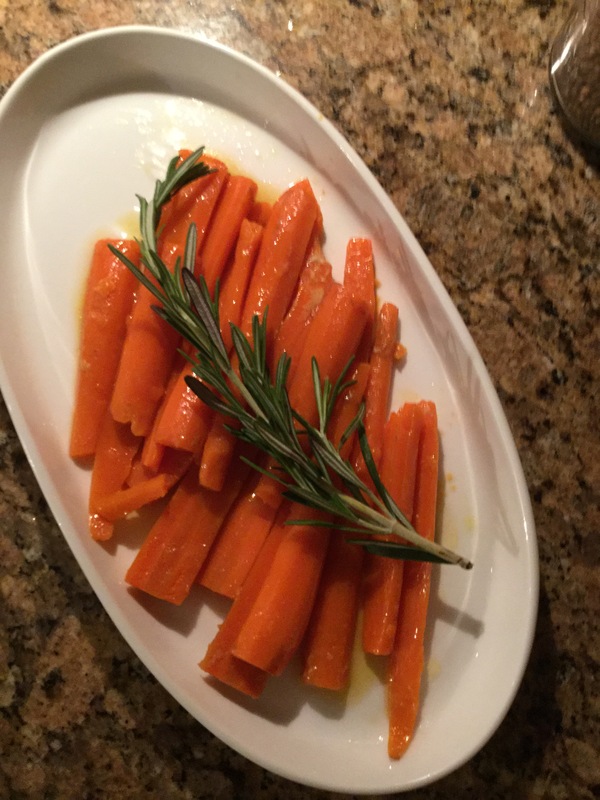 I’m going to suggest that you will want to celebrate this beautiful, sweet, underrated vegetable once you try our recipe for Rosemary and Honey glazed carrots. I’m going to bet that your children will even ask for seconds once they try carrots prepared this way. The method used to prepare these carrots is a bit different from the usual way of boiling the flavor right out. When we prepare the carrots, they retain their color and their flavor. Even Buggs Bunny would agree! There’s one thing that we’d like to express about carrots. Please don’t use those little carrots in the bag! They are “machined” from whole carrots. The outer part and all the nutritional layers are peeled off in the process. They are also soaked in Clorine to maintain freshness. We recommend using whole fresh carrots. You don’t even need to peel them! Vegetables are a necessity for good health and preparing them in ways that preserve the vitamins is always best. You’ll be surprised at how flavorful this dish is and its largely because we don’t loose it all in the preparation. Carrots are a Super-food. Dr. Ann Carrots nutritional value. Here’s our Two Food Nuts Recipe. In a shallow skillet, place the carrots that have been sliced in half lengthwise, add enough water to come half way up the carrots. DO NOT COVER. Add the salt now. Top with the butter and 2 of the Rosemary sprigs. Turn the heat to high and bring to a boil. Then reduce the heat to medium, cover with a lid and continue to cook until the carrots are barely crisp tender. This only takes a few minutes. 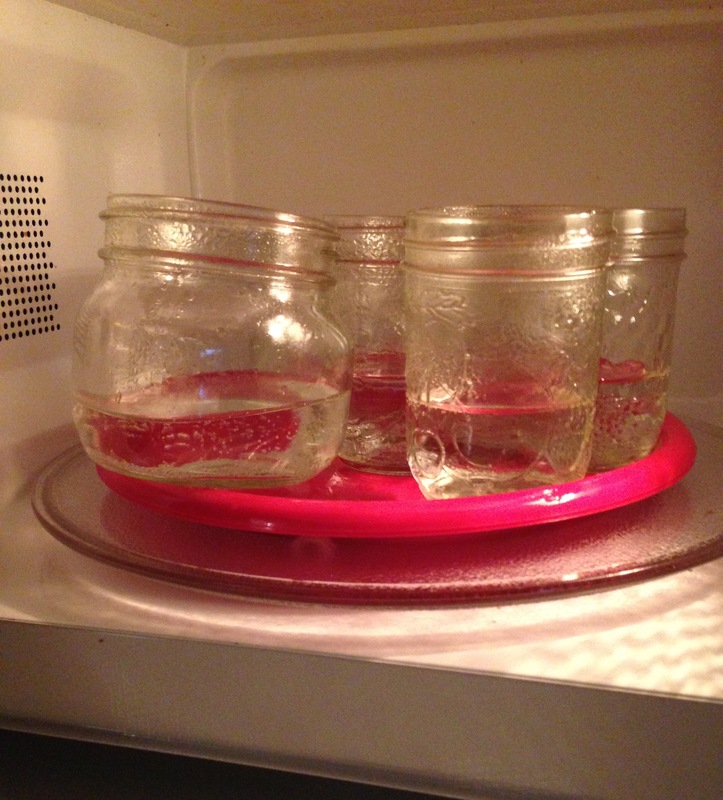 Remove the lid and turn the heat to high just to evaporate the remaining water. Once again, just a few minutes. Remove the Rosemary and drizzle with the Honey. Add Pepper as desired. 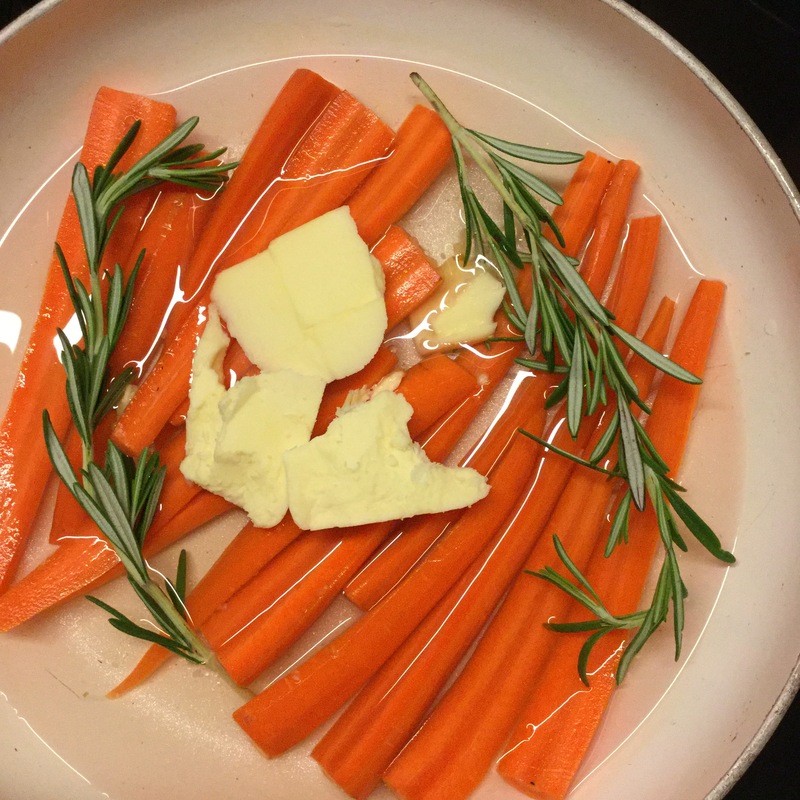 The end result will be Carrots that are tender not limp, the sweetness of the vegetables is further enhanced by the Honey, plus the Rosemary adds a deep earthiness to this already earthy vegetable. No need to add butter either, its been cooked right into the carrots. Now eat your veggies and ask for seconds!